Calling All Photographers! Show off your amazing photo in the 2018 Group Show. The October 2018 Celebrate Swarthmore Photographers Exhibit is fast approaching, which means it’s time to get your original photograph framed and ready to share with the community. Please fill out the form below to enter your work and be sure to click the “submit” button when finished. Payment can be received at the time you drop off your work when using the on-line form below. Spread the word and get ready to enjoy what is sure to be another inspired exhibition of local artistic talent! Deadline to submit form: Friday, September 28, 2018. Artists reception: Friday October 5th, from 6-8pm. Pick-up: Monday, October 29th, 6-7pm or by arrangement with the Exhibition Chair. Who can exhibit: Artists, 18 or older, residing in the Wallingford-Swarthmore school district including Swarthmore College Students. What can be submitted: One or two original works in photography. No reproductions or work that has been previously displayed in Borough Hall accepted. Preparation of work: Photography to be displayed on a wall must be framed where appropriate and wired for hanging. If you wish to exhibit large or heavy work, please call the Exhibition Chair. Entry fee: A contribution of $5 per piece is requested toward exhibition costs, including the reception. Cash or Check payable to “Swarthmore Friends of the Arts”. Last call alert for artist entries! Let’s get your creative expression on display. The 2018 Celebrate Swarthmore Artists Exhibit is fast approaching, which means it’s time to get your art framed and ready to share with the community. Please fill out the form below to enter your work and be sure to click the “submit” button when finished. Payment can be received at the time you drop off your work when using the on-line form. Deadline to submit is Monday, April 23rd and all who are 18 or over and reside in the Wallingford-Swarthmore School District are invited to participate. Let’s spread the word and get ready to enjoy what is sure to be another wonderful exhibition of local artistic talent! Deadline to submit form: Monday, April 23, 2018. Artists reception: Friday May 4th, from 6-8pm. Pick-up: Monday, June 4th, 6-7pm or by arrangement with the Exhibition Chair. What can be submitted: One or two original works in any medium except photography. No reproductions or work that has been previously displayed in Borough Hall accepted. Preparation of work: Paintings and other work to be displayed on a wall must be framed where appropriate and wired for hanging. If you wish to exhibit sculpture, or exceptionally large or heavy work, please call the Exhibition Chair. Small items such as jewelry and ceramics will be displayed in glass cases. Entry fee: A contribution of $5 per piece is requested toward exhibition costs, including the reception. Send payment by check payable to Swarthmore Friends of the Arts, c/o Martha Perkins 121 Park Avenue, Swarthmore, PA 19081 by Monday, April 23rd. Sales: All sales should go through SFoA to assure smooth transfer of payment to the artist and art to the buyer. Please do not deal directly with the buyer; the SFoA contact person is Martha Perkins, martha.perkins@gmail.com or 484-574-3158. A commission of 10% on any sales will be retained by Swarthmore Friends of the Arts. The October 2017 Celebrate Swarthmore Photographers Exhibit is fast approaching. Deadline to submit is Monday, September 25th. 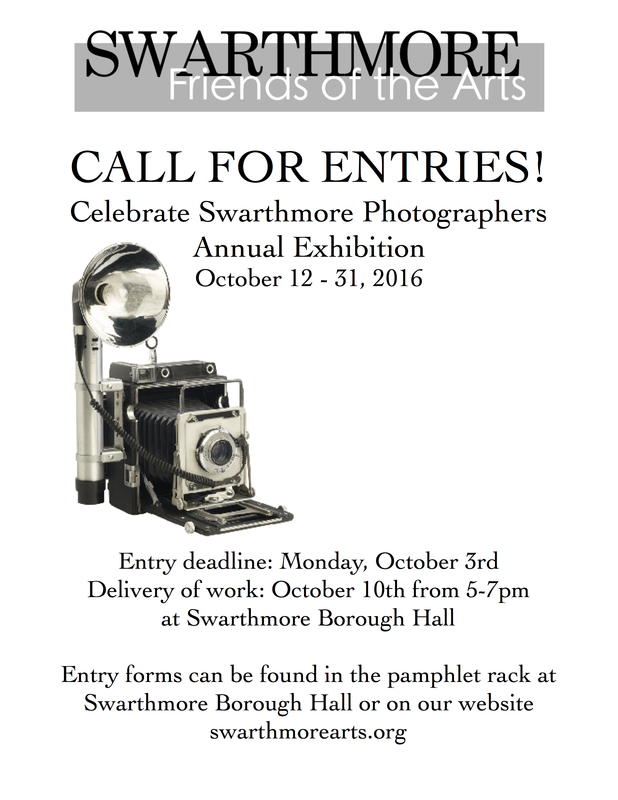 All photographers – age 18 or over and reside in the Wallingford-Swarthmore School District – are invited to participate. The show will be held at Swarthmore Borough Hall for the month of October. Please fill out the form located below to enter your work and be sure to click the “submit” button when finished. If you prefer, there will still be paper entry forms in the brochure rack at Borough Hall. Payment can be received at the time you drop off your work (please bring the printed form with you). Deadline to submit form: Monday, September 25, 2017. Artists reception: Friday October 6th, from 6-8pm. Pick-up: Monday, October 30th, 5-7pm or by arrangement with the Exhibition Chair. Sales: A commission of 10% on any sales will be retained by Friends of the Arts. Please do not deal directly with the buyer. The contact for all sales is Rinal Parikh at rinal.parikh@gmail.com or 610-717-2882. The October 2017 Celebrate Swarthmore Photographers Exhibit is fast approaching, which means it’s time to get your art framed and ready to share with the community. Please fill out the form below to enter your work and be sure to click the “submit” button when finished. If you prefer, there will still be paper entry forms in the brochure rack at Borough Hall. Payment can be received at the time you drop off your work when using the on-line form below. Deadline to submit is Monday, September 25th and all who are 18 or over and reside in the Wallingford-Swarthmore School District are invited to participate. Let’s spread the word and get ready to enjoy what is sure to be another wonderful exhibition of local artistic talent! The 2017 Celebrate Swarthmore Artists Exhibit is fast approaching, which means it’s time to get your art framed and ready to share with the community. Please fill out the form below to enter your work and be sure to click the “submit” button when finished. If you prefer, there will still be paper entry forms in the brochure rack at Borough Hall. Payment can be received at the time you drop off your work when using the on-line form. Deadline to submit is Monday, May 1st and all who are 18 or over and reside in the Wallingford-Swarthmore School District are invited to participate. Let’s spread the word and get ready to enjoy what is sure to be another wonderful exhibition of local artistic talent! Deadline to submit form: Monday, May 1, 2017. Artists reception: Friday May 12th, from 6-8pm. Pick-up: Tuesday, June 27th, 5-7pm or by arrangement with the Exhibition Chair. We are excited to announce that we are now accepting entry forms for our 20th Annual Group Photography show! To enter, print out the form at the link below or pick one up in the brochure rack at Swarthmore Borough Hall. Looking forward to seeing what our talented community has to share, always a thrill.